Enjoy the gift of ample space in an otherwise crowded, yet picturesque, residential area of the island’s medieval city. This villa’s crown jewel is the garden and the yard, where you will find yourselves secluded from the surrounding area by a magnificent and imposing stone structure. The renovated Castle Villa hosts 9 persons. It offers two living-rooms, a spacious kitchen overlooking the Mediterranean garden, a bathroom on each of the two floors, and 3 bedrooms in total, two with double beds and one with three single beds and a bunk bed. 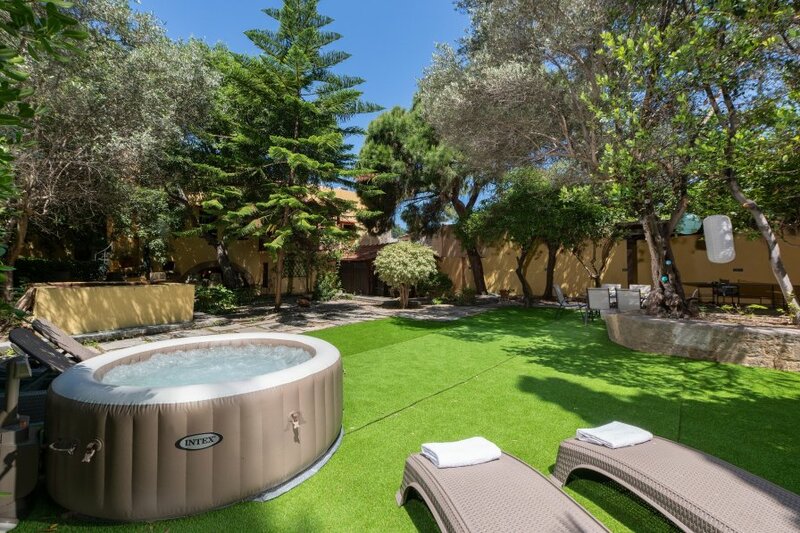 The garden is not just beautiful to look at… you will find that time flies in the Jacuzzi, or at the table tennis, or simply on the sunbeds. The most creative activity you can indulge in is of course the BBQ. The built-in bbq facility is ready to compliment the fully equipped kitchen to satisfy your culinary needs exceed your expectations. Do not let the Castle Villa trap you in its walls with all the comforts of home! Keep in mind, you are in the Medieval city of Rhodes, a historic point of reference throughout the Aegean region for commerce, architecture, travel, spirituality, insularity, war and peace. Make sure you walk the old town’s alleys and explore hidden corners. Visit the Archaeological Museum, the Grand Master’s Palace, the Moat surrounding the town from the south and the west, find the Inns of the Knights of Saint John from England, France, Spain, Auvergne and other parts of Europe. Check out all the shops in commercial streets and taste the local fresh delicacies. And of course, you are less than a 15 minute walk from the closest beach, where the crystal-clear waters will give you a true sense of summer vacation.